Quick overview Nicholas Rankin's revelatory new book, whose cast of characters includes Haile Selassie, Anthony Burgess and General Sikorski, sets Gibraltar in the wider context of the struggle against fascism, from Abyssinia through the Spanish Civil War. Two months before he shot himself, Adolf Hitler saw where it had all gone wrong. By failing to seize Gibraltar in the summer of 1940, he had lost the war. The Rock of Gibraltar, a pillar of British seapower since 1704, looked formidable but was extraordinarily vulnerable. Menaced on all sides by Nazi Germany, Fascist Italy, Vichy France and Francoist Spain, Gibraltar also had to let thousands of foreigners across its frontier to work every day. Among them came spies and saboteurs, eager to blow up the Rock's twenty five miles of secret tunnels. 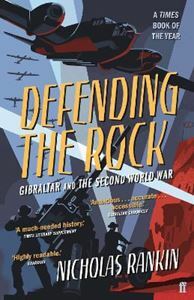 Nicholas Rankin's revelatory book, whose cast of characters includes Haile Selassie, Anthony Burgess and General Sikorski, sets Gibraltar in the wider context of the struggle against Fascism, from Italy's invasion of Abyssinia, through the Spanish Civil War, to the end of the Second World War.